When I finished my self-striping socks last week, I didn't have another project on hand so I started a baby hat with the (substantial amount of) leftover yarn. 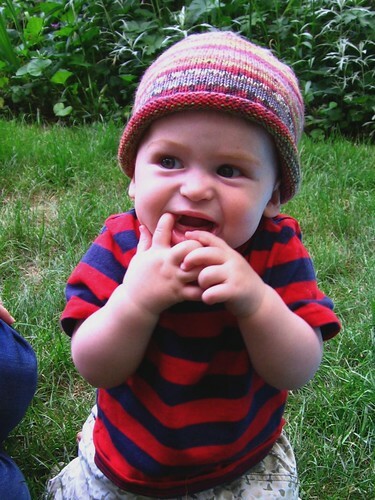 I didn't have a particular plan but figured 100 stitches would make a good size baby hat... and it just happened that it was a perfect fit for my adorable nephew who we were seeing this weekend! Hopefully it will still fit him OK when it gets cold enough for him to need a hat again. 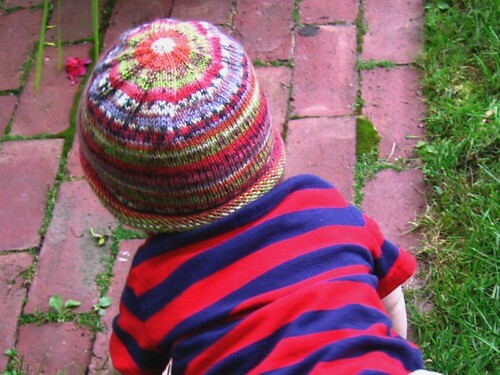 The self-striping yarn makes a super cute hat, especially with the decreases at the top of the hat. He was kind enough to submit to a quick photo shoot even though it wasn't anywhere close to hat weather. 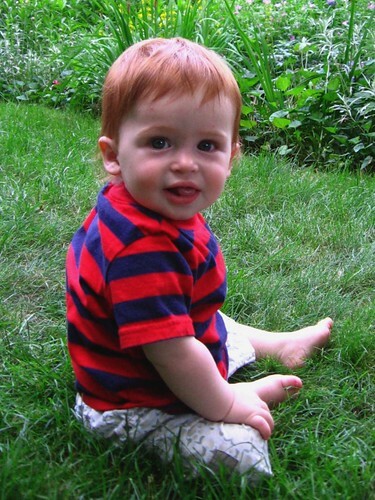 But I wanted to share a hatless photo too - don't you love his red hair?? Your nephew is adorable! And with such a cute hat! Love it! Cute! Cute! Cute! Your nephew is a little charmer! What adorable smiles for auntie!